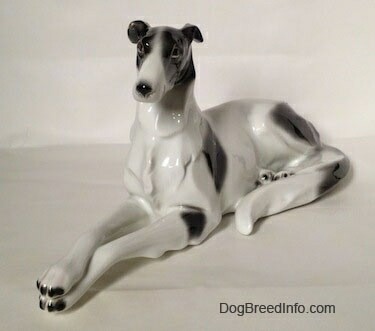 Pictured is a large vintage Borzoi dog by Goebel. 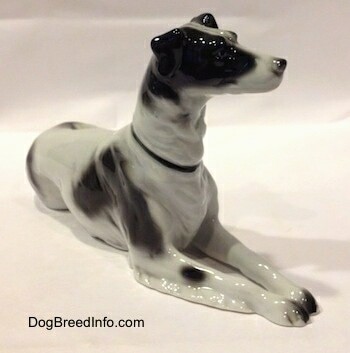 It is of a black and white dog with longer hair on the front legs, the tail and the neck and chest. It is in a lying down pose. 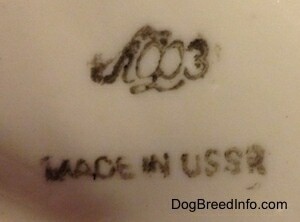 On the bottom of the dog is the Goebel trademark 1 double crown mark. A double crown mark means the mark appears twice on the same piece. 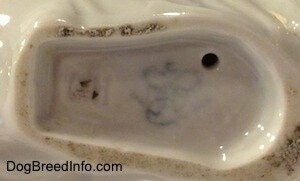 This one has the mark stamped in green under the glaze and an incised mark with a circle around it. There is an engraving that reads 63. The crown marks date the figurine between 1935 and 1949. It measures 5 inches tall from the ground to the top of the head, 11 1/2 inches long from the tip of the paws to the base of the tail and 4 inches wide across the back from tail to hip. 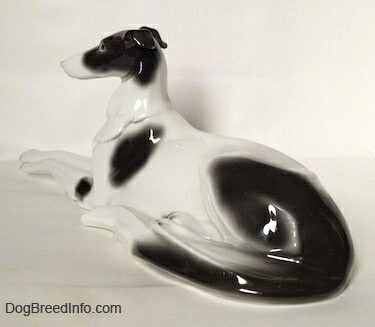 Large vintage Borzoi dog by Goebel—image showing the Goebel trademark 1 double crown mark. A double crown mark means the mark appears twice on the same piece. This one has the mark stamped in green under the glaze and an incised mark with a circle around it. There is an engraving that reads 63. 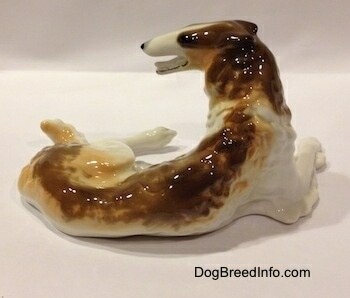 Pictured is a small vintage Borzoi dog by Goebel. 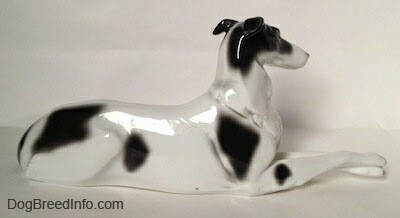 It is of a black and white dog in a sitting pose. On the bottom of the dog is an engraving that reads CH 205. It is missing any type of Goebel mark. It may have once had a sticker. 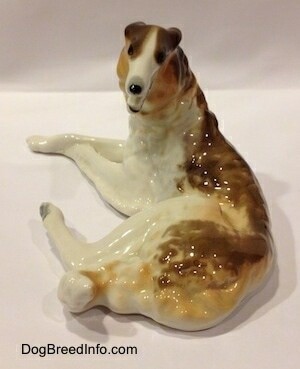 With my experience in collecting Goebel dog figurines this one does indeed look like a genuine Goebel even with the lack of a mark, however when the mark is missing there is always that slight chance it is a copy cat. It measures 3 3/4 inches tall from the ground to the top of the head, 2 1/2 inches long from the tip of the tail to the back and 2 inches wide across the front from paw to tail. 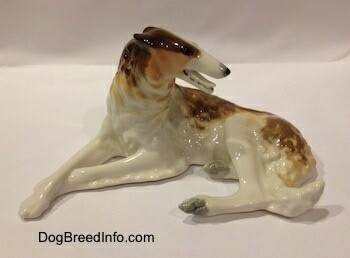 This is a vintage porcelain Lomonosov Borzoi (Russian Wolfhound) dog figurine. It has Made in USSR stamped on the bottom along with the Lomonosov logo. The USSR disbanded in the early 1990s; current production figurines are stamped Made in Russia. This is a beautiful, smooth, glossy dog. 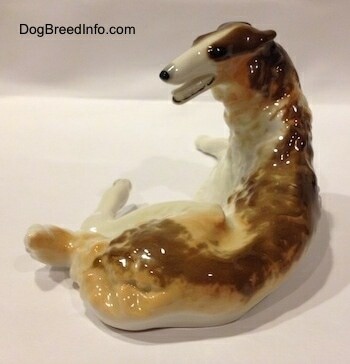 It is white with tan and brown markings. The dog is in a lying down pose. It is roughly 4 inches tall from the ground to the top of the head, 7 1/2 inches long from the tip of the paw to the back and 5 inches wide from the side of the dog to the tip of the tail. 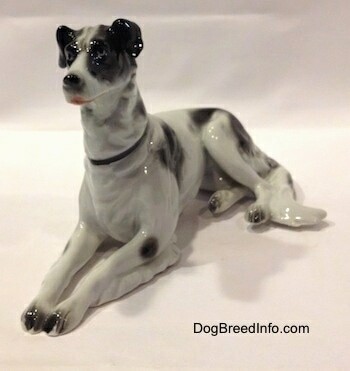 Vintage porcelain Lomonosov Borzoi (Russian Wolfhound) dog figurine—image showing the Made in USSR stamp and the Lomonosov logo. 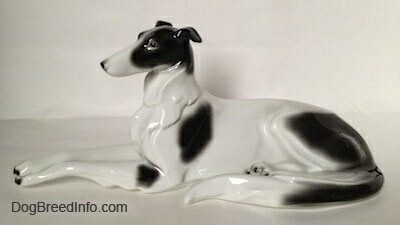 Pictured is a vintage Borzoi dog by Goebel. 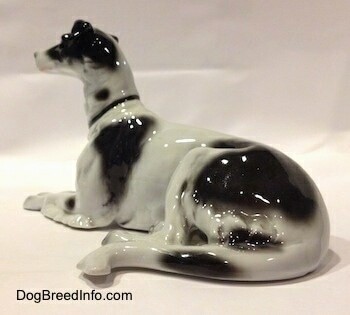 It is of a black and white dog with fringe on the back of the legs and tail and longer hair on the neck and chest. 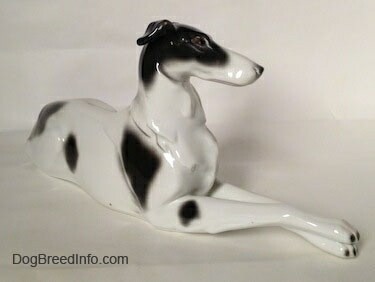 It has a black collar around its neck and is in a lying down pose. 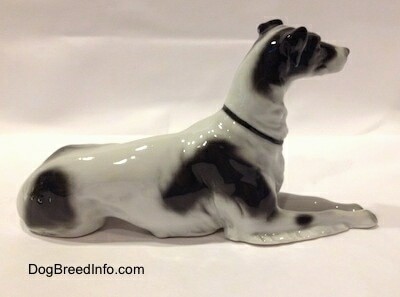 On the bottom of the dog is the Goebel trademark 1 crown mark stamped under the glaze. There is an engraving that reads CH and possibly a number under the stamped crown. 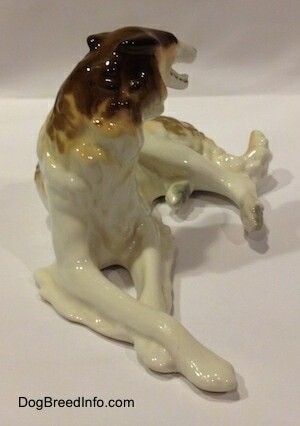 I can feel the indent in the glaze, but I cannot make out what it may say. The crown mark dates the figurine between 1935 and 1949. It measures 4 1/2 inches tall from the ground to the top of the head, 8 inches long from the tip of the paws to the base of the tail and 4 inches wide across the back from tail to hip. 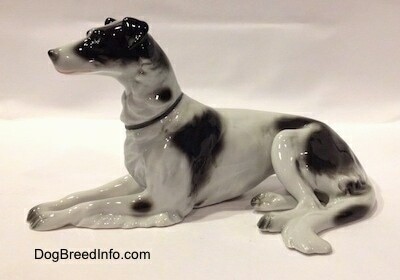 Vintage TMK-1 crown mark Borzoi dog by Goebel—image showing the stamped Goebel crown mark along with an engraving that reads CH. There may also be a number engraving under the crown, however I am unable to make out what it may say. I can feel some type of indent.